There are fried potatoes and home fries, and then there are dutch fried potatoes. I grew up with the real dutch fried potatoes, but we just called them fried potatoes. 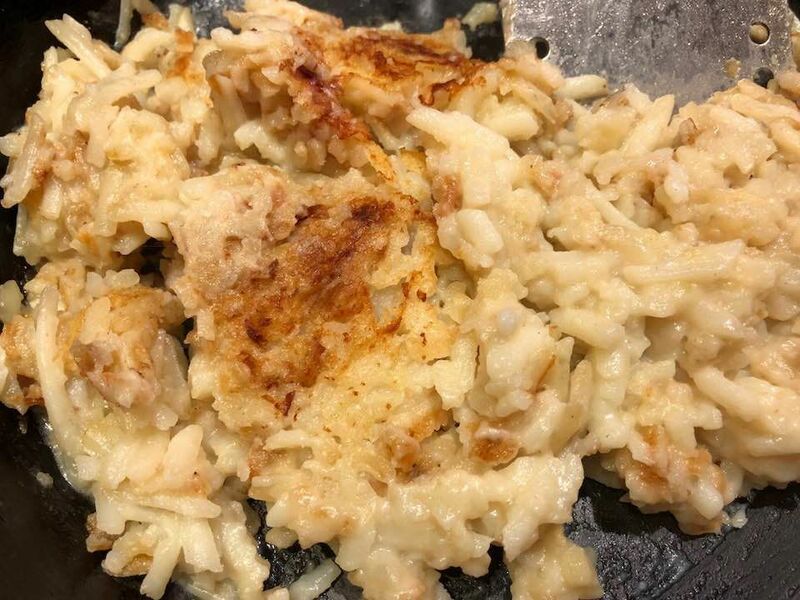 I don’t know of any community where these potatoes are made on a regular basis – unless an individual or two took the recipe with them when they moved away from “home” – which is western Maryland/Somerset County, Pennsylvania. 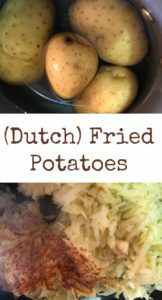 If somebody you know has ancestors who came from that community, they just might know how to make these dutch fried potatoes. My mother often served these with ham or with her meatloaf. 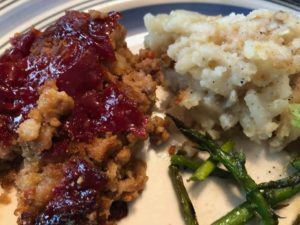 When you serve meatloaf, you don’t have any broth to make a gravy. With these dutch fries, you don’t need any gravy. I still like to serve these potatoes with my mama’s meatloaf recipe. They just seem to go together. Some folks use raw potatoes to make home fries. With these potatoes, you cook them first, then cool, peel, and shred them. Or, if you’d rather, you can slice the potatoes. They will keep in an air-tight container in the refrigerator for days. So if you’ve got a big crowd to feed, you can get these ready ahead of time and then fry them just before you’re ready to serve the food. 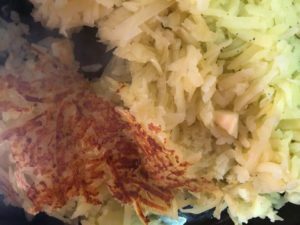 The potatoes you choose for this dish need to have thin peelings – so think you can almost see through them- so you want to stay away from russet or Idaho potatoes. 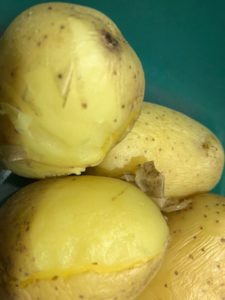 When you use thin-peeling potatoes, you can skin the potatoes easily. It reminds me of pulling sun-burned skin off my arms – it just pulls off without taking any potatoes with it. While the potatoes are still warm, grab hold of a loose piece of peeling, and just peel away, leaving every bit of potato in its place. Remember that the longer a cast iron skillet is heated, the hotter it gets. Be sure not to have your burner on too high or you will be serving burnt offering instead of potatoes. Heat the skillet and put enough butter in that it will cover the bottom of the skillet once it is melted. 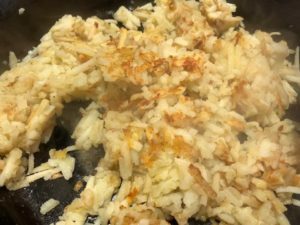 Put the shredded potatoes into the skillet, and then season as you’d like: a little or a lot of salt and pepper. 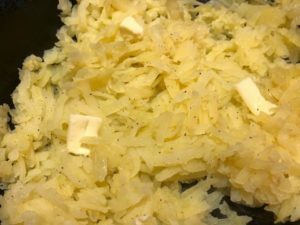 (If you’re an onion fan, you can add some flecks of onion, but don’t tell anybody I said so.) When I was growing up, we never added onions to potatoes. My home community folks won’t consider them dutch fried potatoes if you add onions, I can guarantee you that. Don’t turn these babies too soon, because you want to give them time to brown. My cousin Lucy told me that she puts some butter on top of the potatoes; when the butter has melted, it’s time to turn the potatoes and you’ll have enough butter to keep the potatoes from sticking. Once the potatoes are browned to your liking, flip them over and allow the other side to brown as well. Once the butter is melted, it’s time to turn the potatoes. Half the potatoes have been turned. 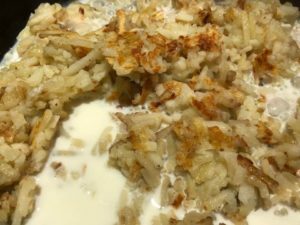 The key ingredient to the dutch fried potatoes is the milk. The potatoes absorb the milk, making them richer and fuller. Add the milk to the potatoes just before you are ready to remove them from the skillet. Divide the potatoes into rivets so the milk can finger its way through all the potatoes. Allow the potatoes to absorb the milk and then turn them over just long enough to make sure there’s no extra milk hiding in there. Allow the potatoes to draw in the milk, and turn them once. This photo shows the milk just after it was added and before I had made rivets. 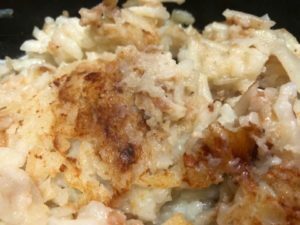 These potatoes work great for a carry-in meal, but wait to add the milk until you’ve put the potatoes into the crock pot or dish you plan to take them in. Fix them at home, add them to a crock pot, add your milk, and you’re ready to go. Not hash browns or home fries, but dutch fried potatoes. These potatoes will stick to your ribs and add a down-home feeling to your menu. Allow milk to seep through potatoes, then flip one more time. From Lucy I learned to peel the potatoes while they are still warm, they peel easier. Then have the potatoes cold before shredding. Dear Gertrude: We have eaten Lucy’s potatoes and they are very good! At home, we called them ‘Sunday potatoes’ without the milk. 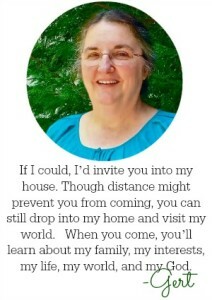 I think about your Mother so often and wish I could have spent more time with her. For some reason, she reminded me of my own Mama!! My family is from Menonite heritage – they called this milk fries and I make them to go with Strawberry Shortcake for dinner! First time my mother served my father Strawberry shortcake for dinner, he thought she was nuts! Now I’m making this for my husband and we both love it. What a great combination…but, we slice the cooked potatoes before browning.